The family traditions of Thanksgiving are many and varied. As a youngster, we always went to my grandmother’s place for a turkey dinner. I loved my grandmother and miss her very much, but she was not a great turkey cook. That bird came out of the oven drier than the Sahara. You wound up needing to irrigate yourself like a personalized Tennessee Valley Authority in order to choke it down. I think, had the Camelbak been around at that point, it should’ve been part of the place settings. Things got to be too much, though, and we started a tradition of going out on Thanksgiving. This would be broken up when someone felt like hosting dinner, but we generally would choose a buffet and go to town. Buffets/smorgasbords have their own special risks. Usually those risks involve eating way too much, but the other thing is that a lot of the food choices simply aren’t good for you. I’m kind of the expert in that kind of diet. Maybe I should make a weight loss video where a camera crew follows me around and then I exhort people to order the exact opposite of what I did order. That might work. Seriously, though, there are ways to make Thanksgiving dinner somewhat healthy, even for dyed-in-the-wool carnivores like me. First of all, I know a deep-fried turkey tastes awesome. I get that… something about that oily juiciness sets it apart. 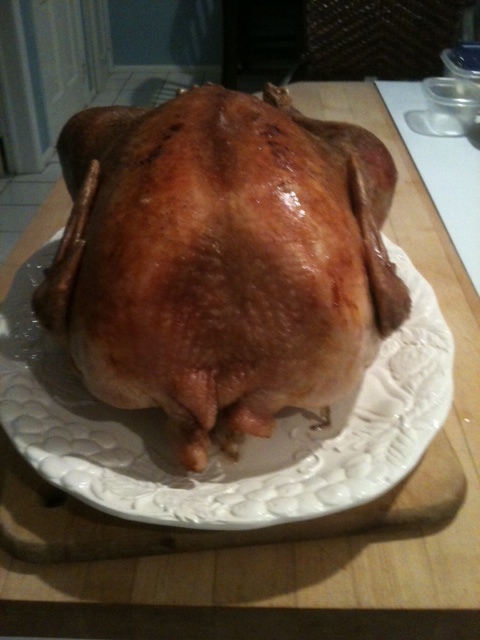 However, it is possible to oven roast a turkey that will rival a friend bird in overall juiciness. I know this because my sister-in-law accomplishes this on a yearly basis. Her bird is perfectly golden brown every time. She claims the art is in the basting, but I’m pretty sure there’s a healthy dose of witchcraft involved as well. The really weak link in the holiday meal chain is the potato filling. This stuff is like a food group all its own, and therein lies the issue. It is soooooo easy to just shovel that stuff on the plate and chow down. It was hard, but I only had one modest-sized helping yesterday, along with a spoonful of corn and some green bean surprise. There was also a huge salad made by yours truly, with a homemade balsamic vinaigrette (recipe below). The dessert selection was stupendous… Supportive Partner Woman (better baker than I!) made a selection of her mom’s favorites, as it was also her mom’s birthday. She made a pineapple upside down cake, a birthday cake, and a pumpkin pie. And, since she’s awesome, she also baked a batch of sugar free cupcakes for me. Of course, there’s the best part of Thanksgiving dinner… leftovers. Nothing like a pile of yummy, juicy turkey to make sandwiches. Or, you can just nuke some of that stuff and you have a lovely, well-balanced plate. That’s all you really need. Combine and mix well. Modify amount of oil is dressing is too vinegary for your taste. Hey, if you or someone in your family has a recipe for potato stuffing, my mom just mentioned she’s been looking for one and can’t find one. It’s what my PA dutchie grandmother always made.